Why are people so hard on themselves? 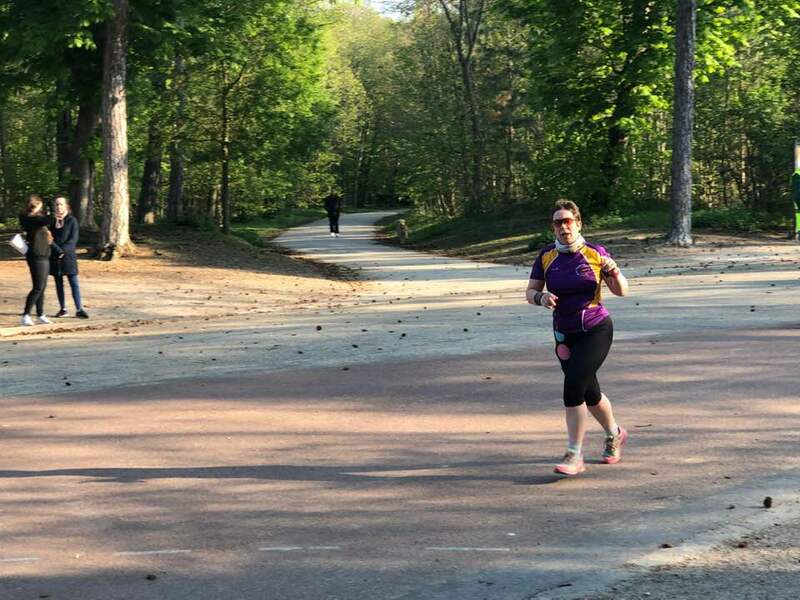 I think it was the Mumsnet lot (they are particularly self-critical) where someone wouldn’t record a new low weight seen on the scales after a fast because “it was a false low”. Weight varies up and down during the day. It will increase depending on what food you’ve eaten and how recently, what kind of food it was, what exercise you’ve done, what clothes you’re wearing. But the lowest weight will be your empty and naked weight. To me, that’s the sensible one to measure and record – so that’s first thing in the morning, no clothes, after a pee. If that’s lower than the last time I measured, I’ll record it. If it’s not, I’ll ignore it. And another thing – debates about where your waist is? It’s the smallest distance around your middle. Again, why all the angst about measuring such and such a distance from your belly button etc – go with the smallest. That’s not cheating. Sometimes it’s as if people are deliberately trying to find ways to fail. New lows for me this week – 134 pounds, and a waist size of 28 inches. 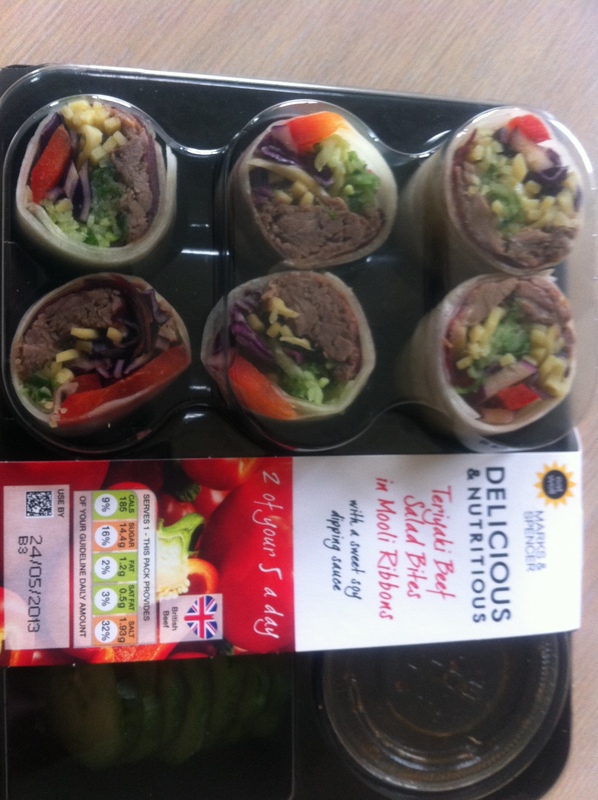 Following recommendations from other forums for the Delicious and Nutritious range, I’d enjoyed the tuna mooli wraps for lunch last week. But I felt they were expensive at £3.50. On Saturday, shopping for something else in the Lisburn store, I got a voucher for £1 off the D&N range. Great, I thought, I’ll have something nice for dinner on Thursday! I couldn’t find any calorie info about the range online, but during the day I’d left 200-250 calories for my meal. So here’s what happened next. I went out of my way to go to the Forestside store where I thought there’d be the largest range. It wasn’t easy to find the D&N range, seemed to be in several places. None of the main meals came in at under 350 calories, and most were 400-500 and above. I went back to the mooli wraps, and chose a beef one. At the till, it transpired that the £1 off did not apply to salads and wraps. Just how petty a decision was that! The barcode when scanned into MyFitnessPal came up as the pork ones, not beef. 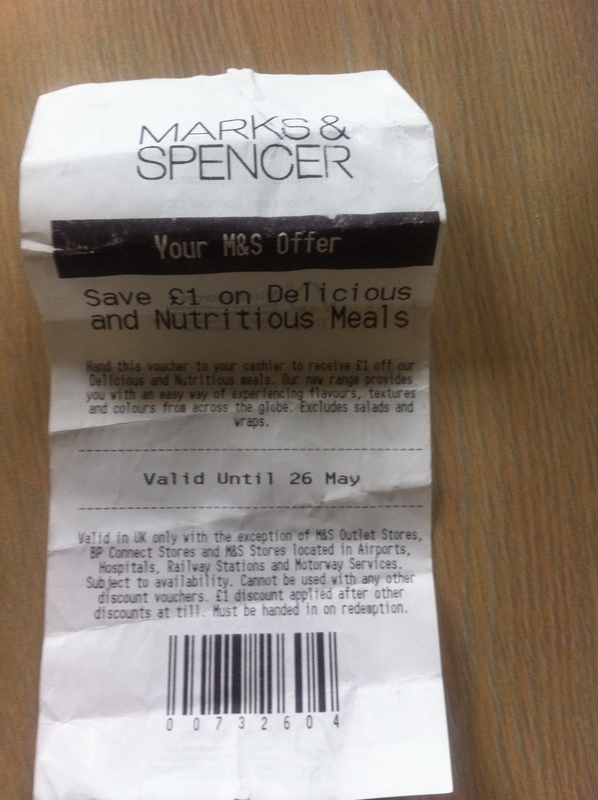 This was a thoroughly disheartening experience, and I will not be rushing back, even to utilise that £1 off voucher. To be fair, I emailed the above complaints, and they replied within 24 hours, but the whole frustrating business has left a bad taste. I reckon I’m better making my own meals, rather than relying on ready made ones. 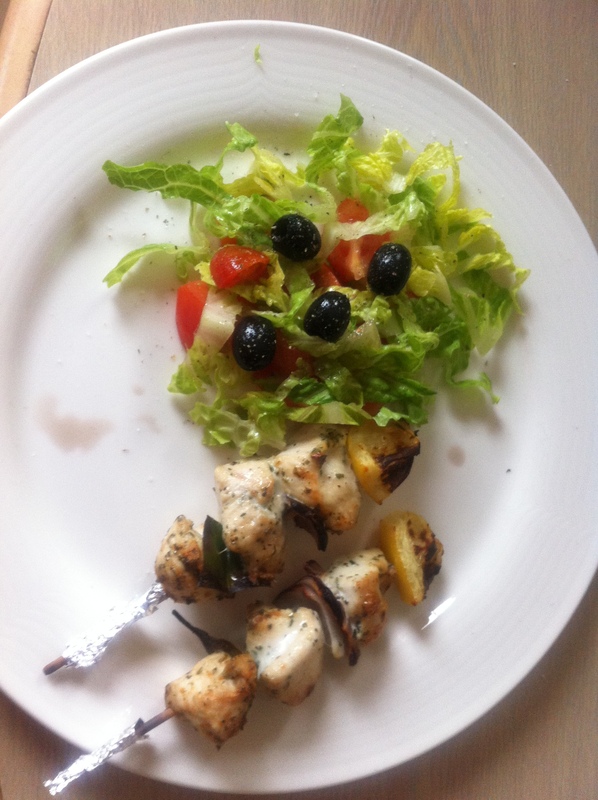 The chicken souvlaki I mentioned last week were rather tasty, at 70 cals apiece. I’d planned to eat all 4, but husband thought they looked tasty too, so I ended up sharing with him. With a large salad, probably 150 cals for the whole meal. These can’t be too hard to make myself, surely! 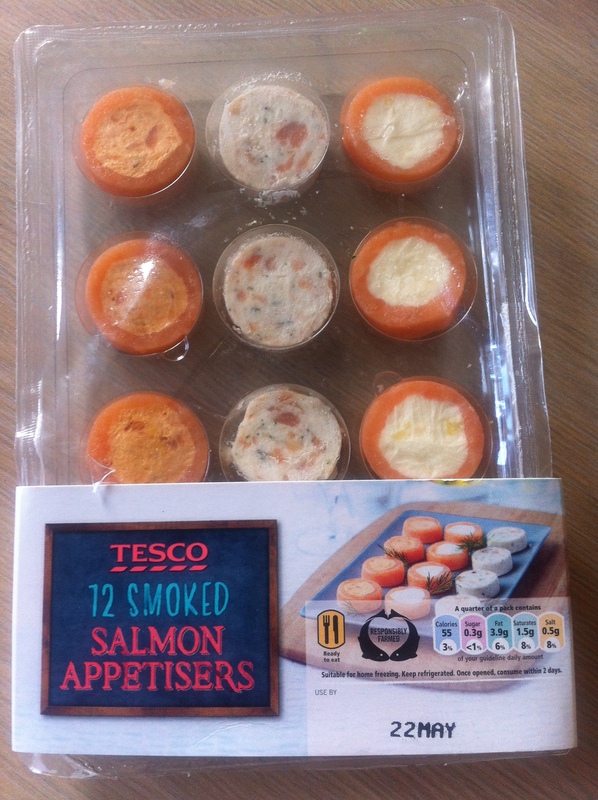 I cannot pass by a bargain, and these little smoked salmon appetisers were reduced to 99p – 25 calories for 3 miniature bites of deliciousness. Next week I think I might dig out those miracle pasta sachets, and try them with some home made bolognese I have in the freezer.